Resistance is Separation from Truth. When you feel fractured it’s natural to protect yourself. There are many ways of working with resistance. Begin by working with resistance instead of fighting resistance. This is simpler than you think. Resistance uses tremendous amount of energy. 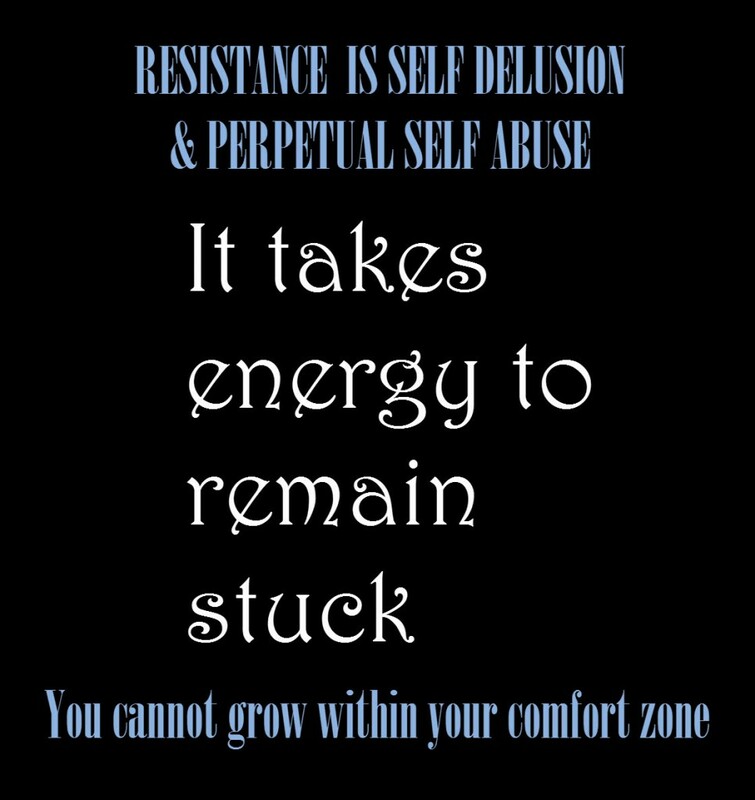 Most humans have been conditioned in a world of resistance that messes up core relationship within themselves. When the energies are in alignment with your connection to your source energy you stop building walls to protect yourself. Grow into the person you were born to be. Stop conforming to a sick system. Social conditioning is only part of living. Some social rules are necessary. Alone these rules represents resistance. Resistance to additional knowledge is then established. To overturn resistance Intuition must be incorporated. Indigenous cultures cultivated their tribes to overcome resistance by connecting them with earth spirit. When you connect to earth spirit fully, intuition becomes part of your life. Earth soul and spirit embraces us when we take our time to know it. A physical feeling of closing the gap of physical and non-physical which is your energy and body merging. Expansion and exploration is the bridge between your body and your soul. Just going with the flow of ordinary thinking is the greatest turn off from life. We are conditioned to seek massage services and counselling that force change. In other words; it’s done to us. People have become victims of labels and systems. Let’s redefine massage services and give it a new perspective. When massages services are provided as a system of therapy that is done to us. Then these massage services are limited to just the physical shift that is at best, temporary. Do keep in mind that this is my observation from my official training. I wanted more out of the massage services that I have Experienced. And so would you when you know there is more available to you. Often I felt just done to and manipulated. The therapist were very well qualified working within the parameters of the accepted massage services. That works extremely well for the average person seeking a qualified massage service. Because these clients have no idea that they are more than just a body. But I knew there was so much more. For the person who was on a path of exploring their purpose in this life, they want more. They want to know how our body mind fits into this world of disconnect. Both brains need to be connected for true tantra to be experienced and expressed. What is necessary for good health and healthy relationships is merging of Left and Right Brains. With merging of left and right hemispheres comes collaboration, understanding, support, appreciation. Both hemispheres are designed to be active. When you are in repetitive behaviour, know that you have exchanged one set of habits for another. But you were seeking to grow. We all have ability to expand our consciousness - We can make our life greater and easier. When both hemispheres are firing together, our purpose is clearer. You can see what you could not see before. When you’re connected with your intuition your let go of repetitive behaviours. Repetitive behaviours do not serve you or your relationships. You become aware of what works for you and what separates you. Repetitive behaviour creates a different puppet but remains the puppet in someone else’s paradise. Experience the divine pleasures of life and rejuvenation that embrace differences in your life. Melting limiting beliefs by first and foremost - debunking dis-information. Explore higher levels by applying beneficial application to every aspect of your life. Assessment of higher distinctions of how you apply as opposed to robotic techniques. Foods you eat and how they affect your ability to connect.